You may got that spin but you aint got that swing. As people are so fast to dismiss everything I suggest you first reproduce the evidence of my magnetmotor theory, by the instructions below. 1 pendulum string of any functional material. something to fix the string to the top of the magnet. well?? hold them next to each other and twist one, does it want to spin back or not? now put 1 on the edge of the table with it's side facing the edge then swing either the north pole or the south pole of the other-magnet passed it. You should be able to do this without pulling it off the table or pushing it away. You attach the pm from the table to a wire and make a pendulum as displayed at the right. 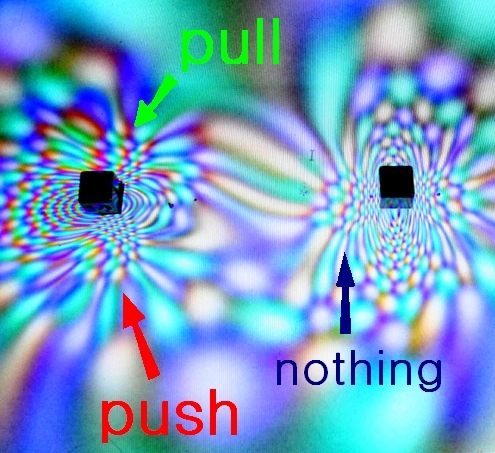 You move the other magnet down(or up) passed it's side again, just like the last 2 times and much like in the image at the right. Find the spot where you can cut the field so that it does spin but doesn't swing. 1) The pendulum doesn't swing -this means it can not have suffered drag. If the magnet you swinged-by had suffered drag - there would have been pendular motion. Drag absolutely demands a point to attach itself to. You may have the spin but you don't have that swing. It dont mean a thing if it aint got that swing!